This version is licenced to be used on one website. Includes all available features. Full email support. This version is licenced to be used on unlimited websites. Includes all available features. Extended email support. Free new versions and all updates. 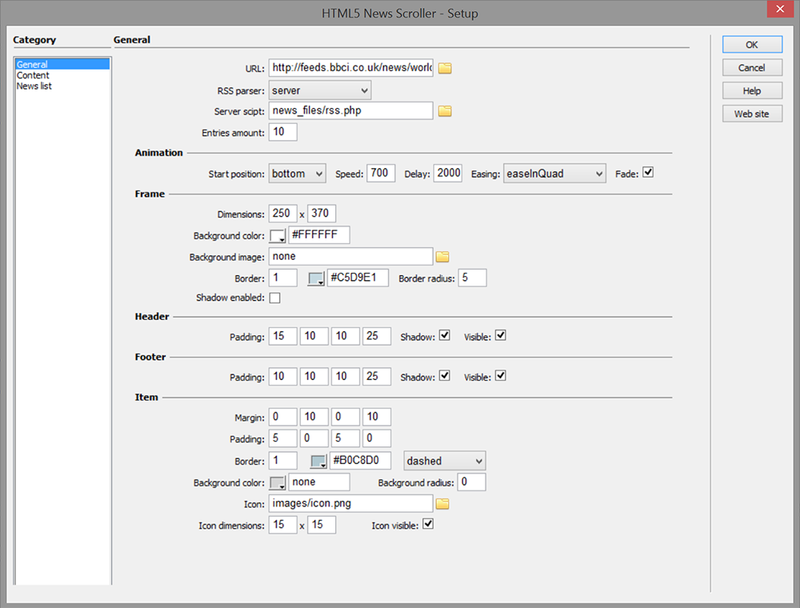 HTML5 News Scroller is distributed as an Adobe Dreamweaver extension, packed as a file, named JQNewsScroller.mxp. Read more in the online help. Enter your email address below to recive newsletter subscriptions. Adding scrolling content to your site or blog makes much sense - it allows you display latest news, promotions, product updates, announcements, upcoming events, testimonials and much more in a limited space. It will help you to add animated content to a static web page. You can even duplicate the Scroller and show different news lists on the same page! HTML5 News Scroller will make news integration into your web site very easy process. It supports two ways to add news data. You can either enter your news in XML file or let News Scroller load the news from RSS feed and build the necessary XML file automatically, to monitor your favorite news sites. Component is fully browser compatible, and will work on iDevices like iPhone and iPad! CSS based which makes Scroller search engine friendly, as all news items and description are placed directly on pages in plain HTML, absolutely accessible to search engines. You don't need to be an expert in web design and to know programming languages to add Scroller to your site. News Scroller is powered by jQuery and it has clear and comprehensible user interface, you can easily set up, change appearance and edit the content of the News Scroller without digging into CSS files! Component is ready to work as soon as it appears on a page and is fast to respond. The installation package contains Dreamweaver extension, providing you the ability to easily create high-impact, HTML5-powered scrollers, all in Dreamweaver CS3, CS4, CS5, CS6, CC 2014, 2015, 2017 and CC 2018. Using the user-friendly interface, you can adjust all colors, fonts, sizes, spacing and wide range of options including more than 50 parameters that you can adjust according to your taste. There is no need to dig into CSS files to make some changes in Scroller style. All colors, fonts, sizes, spacings and other - can be changed to fit the look and feel you want with few clicks. 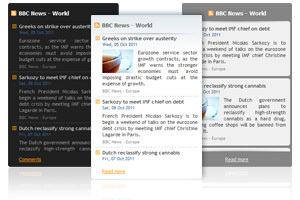 Read news from local XML file or remote RSS feed like BBC, Ebay, etc. News Scroller allow to adjust scroll speed of the news list and set necessary delay between news. You can easily create necessary list of news, using news editor. Through the news editor you can add or remove news items, move them up, down, or add links, title, date and description. Scroller has different transition types of news scrolling animation. It is possible to add HTML code in the news description. Installation package contains Dreamweaver extension. 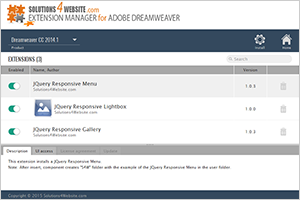 Dreamweaver extension allows you to easily create HTML5 News Scrollers. Extension has user friendly interface. The extension inserts code which is fully W3C valid. © 2007-2016 Solutions4website.com. All rights reserved.